What's the Future of Business is not a question, it's an answer. Introducing What's the Future of Business? 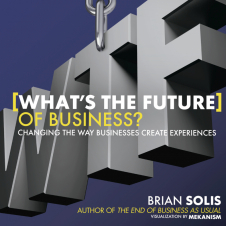 Changing the Way Businesses Create Experiences, the latest book from best-selling business author Brian Solis. The title is an acronym for WTF, a playful approach to the frustration we all feel in trying to get businesses to listen let alone change. But WTF shares in a clever way what to actually do about it. What's the Future explores the landscape of connected consumerism and how business and customer relationships unfold and flourish in four distinct moments of truth.It continues the journey following Brian's last book,The End of Business as Usual,which focused on the rise of connected consumerism and the need for adaptive businesses models. If markets are conversations and consumers are connected, WTF aims to inspire a movement that fosters meaningful and shareable customer and user experiences. The book also takes readers on an uplifting "hero's journey" to help them bring about change from the inside out. The end result shares with readers see how experience design amplifies customer relationships, drives word of mouth, and fosters organic advocacy. Brian also believes that the only way to convey the importance of an experience is to make the book an experience itself. WTF is also a visual journey…think digital app but in an analog format. Brian reached out to his friends at Mekanism, a well-known creative agency that focuses on storytelling for emerging media. Additionally Hugh Macleod (@gapingvoid) picked important themes from each chapter and developed original art to bring personalize each message.The result is, well, something Brian hopes you find engaging, entertaining and useful.